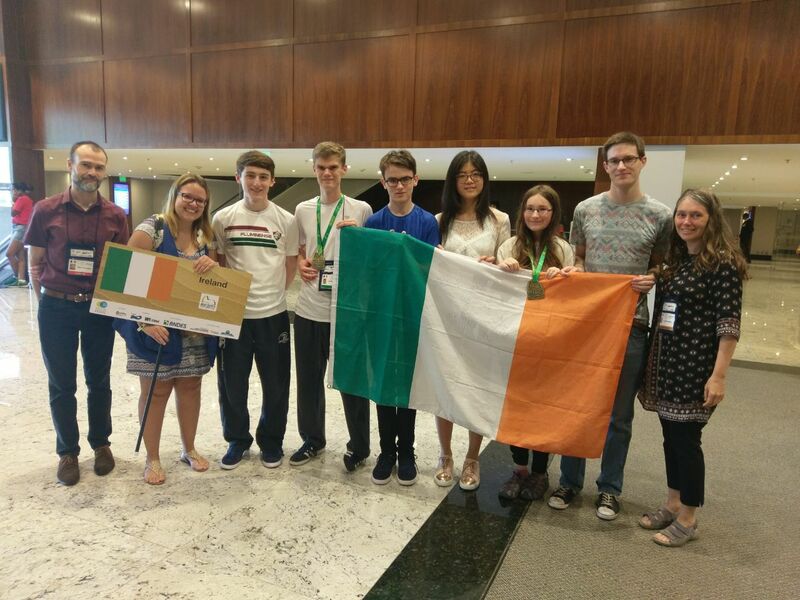 The Irish Team at the International Mathematical Olympiad in Rio. CONNECT’s Dr Mark Flanagan has led the Irish team at the International Mathematical Olympiad (IMO) in Rio to its best performance since entering the competition in 1988. Mark is an Associate Professor at the School of Electrical & Electronic Engineering at UCD and a Funded Investigator with CONNECT. Cillian Doherty (6th Year at Coláiste Eoin, Booterstown, Dublin) and Anna Mustata (5th Year at Bishopstown Community School, Cork) have won Bronze Medals – the first time Ireland has won two medals at an IMO since first competing in 1988. Ireland’s team score was also the highest ever achieved by an Irish team in the competition. 112 countries competed in this year’s contest. Ireland’s four other team members received Honourable Mentions. They are: Antonia Huang (Mount Anville Secondary School, Dublin); Mark Heavey (Blackrock College, Dublin); Mark Fortune (CBS Thurles Secondary School, Tipperary); and Darragh Glynn (St Paul’s College, Raheny, Dublin). Anca Mustata, a lecturer in the School of Mathematical Sciences in UCC, was Deputy Leader. The International Mathematical Olympiad (IMO) is the World Championship Mathematics Competition for High School students and is held annually in a different country. The first IMO was held in 1959 in Romania, with 7 countries participating. It has gradually expanded to over 100 countries from 5 continents. In addition, CONNECT’s Dr David Malone and Hazel Murray at Maynooth University are also involved in training students for the International Mathematical Olympiad. The team there work with over 100 students face-to-face as well as providing remote training during which problems are posted to students who send back their solutions.